Die! Boo! Die! 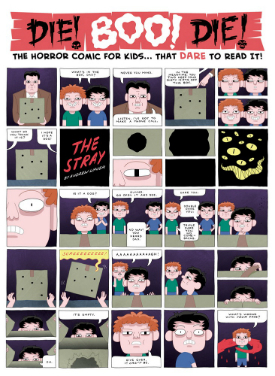 – Deliciously Creepy Horror Anthology Comic for Kids Features Rob Davis, Simon Gane, Becky Barnicoat, Jack Teagle, Donya Todd and More! Remaining age appropriate while avoiding patronising your audience is one of the great tests of children’s literature. It’s a difficult line to walk but in UK comics, at least, we have seen an upsurge of quality kids work over the last few years that avoids the trap of speaking down to its readership. There’s the obvious likes of the weekly The Phoenix, micropublished gems including EdieOP’s Maleficium from Avery Hill, exciting online projects in the shape of Moose Kids Comics, and a variety of small press books of which Bell and Slorance’s Dungeon Fun has been most notable in its high profile since 2013. Die! Boo! Die! is the second edition of the Paul Harrison-Davies and Andrew Waugh-edited Boo! 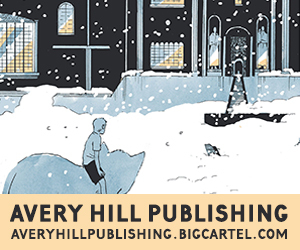 Comics anthology featuring a plethora of indie comics talent working on supernatural comics shorts aimed at a younger readership. This follow-up issue wisely avoids direct sequential numbering. It’s a sensible move given that numbered comics can be uninviting on the small press shelves implying, as they do, a sense of inaccessibility and incompleteness to the material within their covers. Underlining its discrete physical identity from its thematic predecessor Die! Boo! Die! is also presented in a gorgeously tactile fold-out newspaper format, allowing the creators an added layer of storytelling potential in terms of how they utilise that larger canvas. 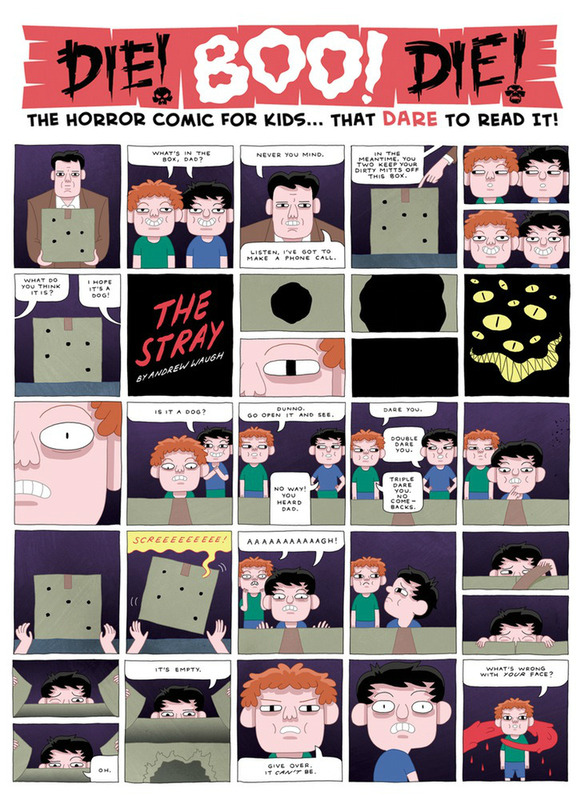 The opener for example – Andrew Waugh’s ‘The Stray’ (on the cover, right) – makes excellent use of the larger A3 size and its two pages are crammed with smaller panels that allow Waugh to fully exploit the possibilities this affords for comedy timing. It’s a cracking piece of pacing as two children are left in charge by their father of a box that contains a lost animal that may not be entirely what it seems. One of the comic’s most unsettling entries comes from writer Rob Davis and artist Simon Gane‘s ‘The Granny Annex’ (below). It concerns a young girl’s dislike for the sinister grandparent whose intrusive presence in the family home has proved so disruptive and unwelcome. This one is particularly creepy in that the horror comes from unembellished reality and the simple cruelty of words. Gane’s visuals here have a highly atmospheric level of disturbing detail, and the sense of dramatic tension he imbues the story’s second page with is almost palpable. 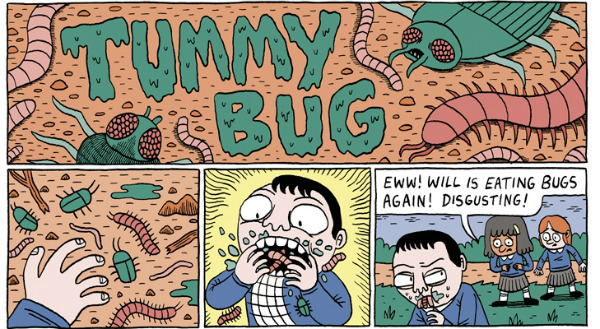 Jack Teagle (below) has been something of a favourite in ‘Small Pressganged’ this year and his offering ‘Tummy Bug’ about a rather gross schoolboy who ostentatiously consumes insects in front of his peers has a cartoony Kafka-esque appeal to it. There’s a similar theme to James Howard’s ‘Don’t Pick it!’ which also embraces ideas of body horror (along with childhood scabby knees!) to a violent slapstick effect. Familiar standards of horror are played with throughout. 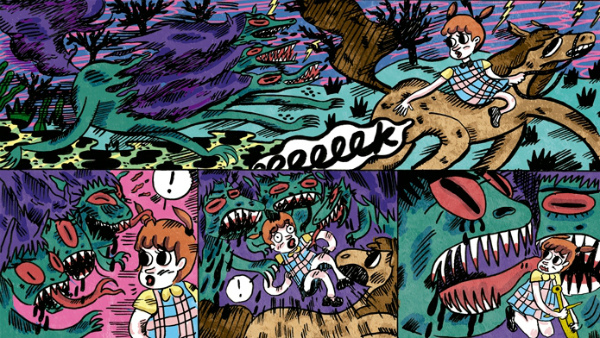 Both Jonathan Edwards and Kelly Bastow touch on the chilling idea of the haunted toy and Becky Barnicoat’s ‘The Fetch’ uses that primal fear of separation from parents in a doppelganger terror tale. Donya Todd (below) delights with another of her loose narratives that underlines how suited her distinctive visual stylings are to the genre while Paul Harrison-Davies’s haunted fairground centre-spread is full of menacing decrepitude. Robert Ball practically steals the show, though, with an eerie two-pager that is all about the turn-of-the-page reveal. Whether Die! Boo! Die! occasionally forgets its target audience and veers into the territory of adult horror presented in the style of children’s comics/illustration will, perhaps, be a matter of individual opinion. It is incredibly dark in places with a truly morbid sense of humour so those of a sensitive disposition should be warned! While the work on show rarely deviates from oft-trod paths within the genre there’s no doubt that Paul Harrison-Davies and Andrew Waugh have curated a gleefully sinister collection of shorts in these pages which will undoubtedly have a mischievous appeal to the younger reader. You can order copies of Die! Boo! Die! 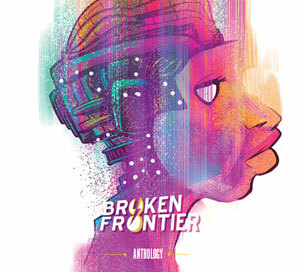 from the comic’s online store here priced £5.00.